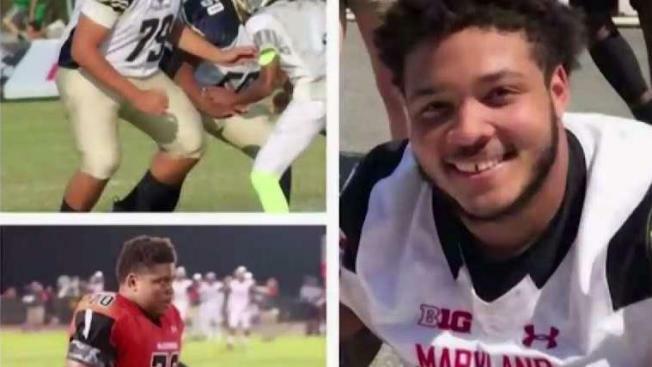 William Tarrant was heartbroken as he remembered the last time he saw his 19-year-old nephew, Jordan McNair, alive before the teen headed to University of Maryland for football training. "I had just cut his hair," said Tarrant. "Never thought I would never see that boy alive again." "Next time I saw him was when I was cutting his hair for getting him ready for his funeral," Tarrant remembered in an emotional interview with News4. Tarrant said he's very clear on the circumstances surrounding his nephew's death. "University of Maryland killed my nephew. Their training staff, them people, they killed my nephew," he said. Terrapins football coach DJ Durkin and two other high-ranking officials were placed on administrative leave. Murphy called for Durkin to be fired following an ESPN investigation that showed an abusive and toxic environment that may have contributed to McNair's death. "That style of coaching creates the belief that the player is malingering. He's a chump. He's a punk," said Murphy. University of Maryland President Wallace Loh said in a statement that the school is committed to a safe and humane football program that supports student-athletes. "Humiliating and demeaning a student is not only bad teaching and coaching, it is an abuse of the authority of a teacher and coach," Loh said. But for McNair's family, those words are not enough. "They knew what was going on down there in Maryland. They knew. We didn't, or we wouldn't of been there," Tarrant said. Durkin was placed on administrative leave Saturday in the wake of reports that he and his staff verbally abused and humiliated players after his arrival in College Park, Maryland, two years ago. Two other high-ranking members of the athletic training staff are also on administrative leave. The family intends to file a civil suit against the university after an independent investigation is released. That investigation is set to be released by Sept. 15.